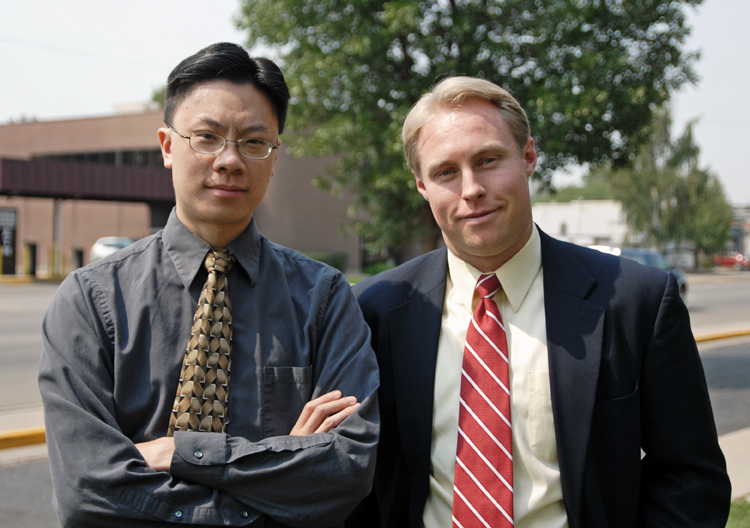 Han Ng, left, and Matt Tjosvold recently received promotions following Brett Barkey’s appointment to 14th Judicial District Attorney. Ng has accepted the position of assistant district attorney and will continue to serve the 14th from Grand County. Tjosvold will remain in Craig serving as chief deputy district attorney for Moffat County. Earlier this week Gov. John Hickenlooper appointed Brett Barkey to the office of district attorney for the 14th Judicial District. The announcement was made following the July resignation of Elizabeth Oldham, who stepped down as the 14th Judicial District Attorney to accept the senior deputy district attorney job in Arapahoe County. Though the appointment is technically slated to expire in January, Barkey, a Hayden Republican, also is the only candidate vying for Oldham’s former position in November’s general election. With victory in November more or less a formality, Barkey has wasted little time in reorganizing the structure of the 14th Judicial District. And on Wednesday two prosecutors tied to the 14th Judicial District’s Moffat County office discovered they had been selected to serve key roles in Barkey’s administration. Han Ng, 32, was offered and has accepted the position of assistant district attorney for the 14th Judicial District. The Denver native, who earned his juris doctorate from George Washington University Law School in 2003, served as a district attorney for five years in Arapahoe County before moving to Moffat County last year. He will serve the district in his new capacity from the Grand County office. Matt Tjosvold, 30, is the other piece of Barkey’s initial restructuring scheme. Also a Denver native, Tjosvold earned his juris doctorate from Vermont Law School in 2009 and has spent the early part of his career serving the 14th Judicial District in Grand and Moffat Counties. Though Ng’s new role is taking him to the eastern part of the district, Tjosvold has accepted the position of Moffat County’s chief deputy district attorney. As the new assistant district attorney, Ng will spend less time in the courtroom and transfer into a mentoring role. Despite his admiration of Ng as a capable prosecutor, Tjosvold believes the move to mentor will be a natural one. Ng similarly praised Tjosvold and his abilities to handle Moffat County’s top DA position. “I’ve seen him, in the last several months, handle some pretty big, important and complex cases, so he has the skills to do it,” Ng said. “Plus, he has a really good head on his shoulders and a great relationship with law enforcement in the area, but he also understands the distinction between law enforcement and his role as a DA. In December, when Barkey announced his candidacy for 14th Judicial District Attorney, he pledged to keep the “band together” if elected in November. So far, Tjosvold and Ng have been impressed by Barkey’s “inclusive” management style and the way he refers to everyone in the district as being a member of the team. It’s a culture that already feels very different from Oldham’s. “But every time you say that there’s the implication that the person before was somehow different in a bad way and that’s not the case,” Tjosvold said. “It’s not that Liz wasn’t inclusive,” Ng added. “but each office had a certain level of autonomy and she was more inclined to allow each of the three offices in the district to develop their own particular cultures.